Conveniently located between Somerset Road and Orchard Road, just opposite Somerset MRT station, 313 @ somerset enjoys a natural traffic from the crowd joining Orchard Road from the MRT station. With 294,000 sq ft of retail offer throughout 8 levels, 313 @ somerset is particularly appreciated for its wealth of High street fashion stores such as Zara, Uniqlo, Forever 21, New Look and Esprit. It's also a convenient spot to have a coffee at Ya Kun Kaya Toast or a lunch at Brotzeit German Bier Bar & Restaurant, Din Tai Fung or the bright modern Food Republic outlet on level 5. 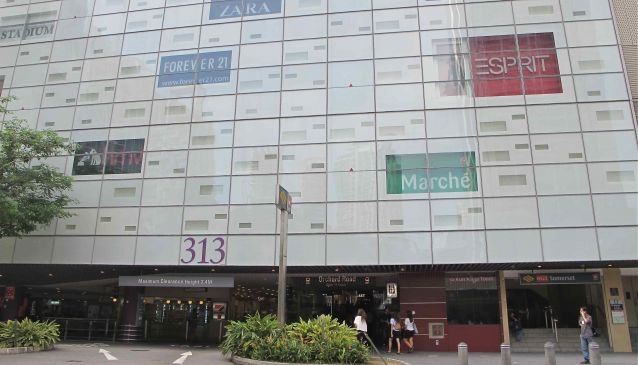 313@somerset also features some popular lifestyle outlets including Epicentre and Popular bookstore attracting many executives and fashionistas. Complementary loan of wheelchair; Sistic services (Mon to Sat 10am to 8pm and Sun12pm to 8pm) at the Concierge Centre on Basement .